Feeling panicked about Valentine’s Day? Here are some last minute gift ideas to help take the thought out of thoughtfulness. First you must determine your budget, length of time together, and the type of girl/guy you’re dating. Are they the traditional type? If so, then flowers, chocolates, cards and jewelry (depending on budget) will suffice. Are they more casual or humorous? Have you been dating for a short time? Then little gag gifts can be a little more fun and appropriate. For example, the Common Market in Plaza Midwood has an entire section dedicated to funny gag gifts. If your significant other appreciates thoughtful gestures try something handmade: cut out heart, framed photo, etc. Other thoughtful gestures can include something they’ve expressed interest in, like yoga in which case you could get them a groupon for a new yoga studio. 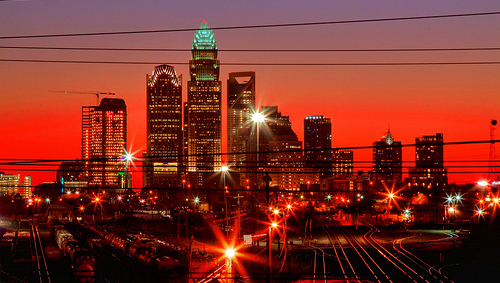 If you’d like to take your sweetheart out to a romantic dinner on Tuesday night, check out our list of the Top 10 Most Romantic Restaurants in Charlotte. Choose carefully but make your decisions quickly because the clock is ticking!